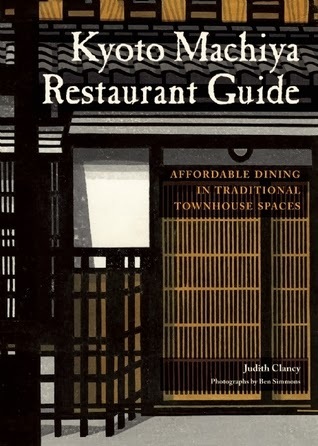 Long time Kyoto resident, Judith Clancy, released her Kyoto Machiya Restaurant Guide in late 2012. This is an an excellent restaurant guide to Kyoto's more up-market restaurants housed within renovated traditional Kyoto machiya-style townhouses with photographs by Ben Simmons. Options for those on a budget are hidden in between, too. The history of machiya in Kyoto is well detailed, and many facts about each of the buildings are included in each restaurant's write-up. Every resident of Kansai at least - and anyone visiting Kyoto, for that fact - should buy this and Clancy's Exploring Kyoto. Both are indispensable guides that work well together. Having done a lot of work dealing with Kyoto recently, I appreciate Clancy's work and grasp of Kyoto, its culture and its history even more. If you want to do your friends and family a favour, buy them Kyoto the City of Zen. Definitely the restaurant guide and the on-foot guide to Kyoto are a must, whether you live in Japan or are just travelling through. Both highly recommended. Judith will be talking at a machiya restaurant for the Society of Writers, Editors, and Translators (SWET) on May 11, 2014, in Kyoto. Check the web site for more details. Read an article on the SWET web site about the evolution of the restaurant guide.